Oxford University’s JazzSoc congregates at The Hatter every Tuesday to put on an evening of excellent entertainment. Their renowned night is popular with students and non-students alike. It’s the ideal place for jazz musicians and jazz enthusiasts, from casual to diehard, to chill with some friends and enjoy great music. The evening kicks off with a performance by a special guest musician, before the stage opens for jamming the night away. Have a listen to some smooth jazz and then showcase your own musical talents. Tori Freestone is a British saxophonist, flautist and violinist who performs at the forefront of the UK improvised music scene as both a sidewomen and highly regarded bandleader. Freestone is known for her robust tenor sound, melodic invention as well as an ability to amalgamate into a variety of styles and musical contexts while maintaining her highly personal voice. 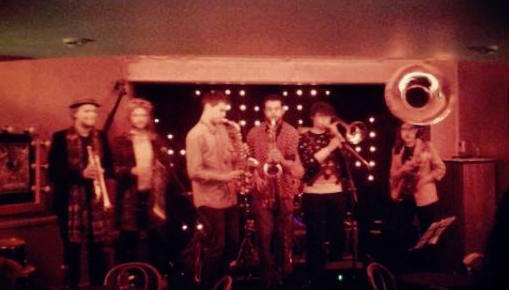 Oxford’s most exciting funk band is coming to Jazzsoc! Expect only the funkiest grooves, deepest soul vocals and dirty horn stabs, as well as some of the best solos you’ll hear at Jazzsoc. Come down for a dance party! Stefanos Tsourelis is a guitarist, oud player and composer based in London. He moved to London in 2005 and studied at The London Guitar Institute. He was taught and inspired by great guitarists such as Shaun Baxter, Mike Outram and John Wheatcroft, and was awarded the prestigious title of ‘Best Guitarist of the Year’ in 2008. Waaju believe in highlighting the world’s connection through less familiar creative collaboration. Encapsulating influence from a number of cultures across Africa, South America & beyond, the band delves deeper to leave behind preconception & promote forces largely unexplored in a Western context. Citing the rich history of Malian music as centrepiece, Waaju presents the vision of drummer & percussionist Ben Brown which draws from the exceptional spirit of the likes of Ali Farka Toure, Oumou Sangare, Tinariwen & Baba Sissoko. We are very excited to be hosting another one of Oxford’s own student bands! Bluephoria is a quintet focused on presenting its own unique version of contemporary jazz. At the intersection of funk, blues, hard rock and world fusion, its members deftly weave these threads to produce a truly eclectic sound. Duncan Eagles a London-based saxophonist. Throughout his career so far, he has appeared at many major venues and festivals around the world. Duncan is recognised for his work with critically acclaimed band, Partikel who have released four albums to date and have been met with praise form the UK, European and USA press. In 2017 they were nominated for a parliamentary jazz award in the category of “Best Jazz Ensemble” alongside Phronesis and Binker and Moses. More details about all of these events can be found on OU Jazz Soc’s facebook page.